TheraNest staff with Billing Permissions have the functionality to create client statements. Statements can either be created individually or in batches across multiple clients. Follow the steps below to generate an individual statement for a single client. 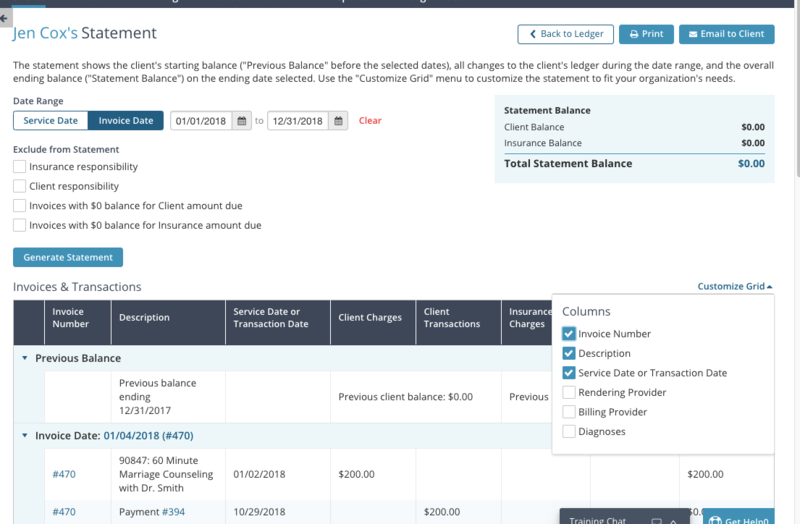 Navigate to the client's Ledger page; click the blue Statement button at the top. The statement's date range will default to the current month. Adjust it to your desired date at the top of the page under Date Range. You can filter by Service Date or Invoice Date. Use the Customize Grid menu on the right to augment the statement with information based on your client's preferences by checking the boxes. Description and Service Date or Transaction Date will be checked by default. Once checked, items will be applied to the Invoices & Transactions section of the statement grid. Check the boxes under Exclude From Statements to further customize the statement and exclude insurance responsibility, client responsibility, or $0 balances related to either. Once your desired date range and customization options have been entered click the Generate Statement button. Use the Clear option in the Date Range section to clear these filters and any Customize Grid items selected at any time. Previous Balance refers to the client's starting balance before these selected dates. The statement captures all changes to the client's ledger during the date range, and shows an ending balance for this period, the Statement Balance, based on the end date selected. If a client or insurance balance is a negative number, then there is a credit on the client's account for the selected date range. If a client or insurance balance is a positive number, then there is a balance due that the client or insurance owes. A pop-up message will appear with options to adjust the Statement Date, add a statement message, show the client's insurance and personal info, and display a preferred name. Here's a quick video to walk you through creating client statements.